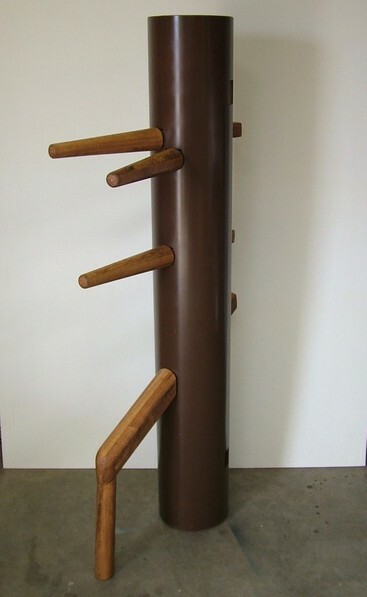 Traditional Wing Chun dimensions and design. Made and sold by Raven Studios since the year 2000 – The body is 56″ tall and made from 8.5″ diameter PVC pipe that is 3/8″ thick (schedule 40) with a cap on the bottom so it can be filled with sand bags for added weight if desired. Painted dark brown and sealed with a protective clear coating. Weight is about 35 lb. The arms and leg are laminated hard maple. Price includes: Dummy body, 3 arms, and 1 leg. This jong is very rugged, durable, great for outdoor use, and is easy to transport. There is no waiting list for the PVC jong and the turn around time is normally about 12 weeks. The PVC jong must be mounted to a stand to be used. It has the same support slat holes in the sides of the body as a traditional wooden dummy and it can be mounted to a traditional floor or wall stand, the same as a wooden dummy body. SKU: 160. Category: Mok Yan Jong (Wooden Dummy). Tags: PVC Dummy, PVC Mok Yan Jong, PVC Mook Yan Jong, PVC Muk Yan Jong, Wing Chun PVC Dummy. In 1993 I began studying Wing Chun Gung Fu. At that time I was working for a fabrication company (The Larson Co.) that made fake trees (among many other things) for zoos, museums and aquariums. We used various sizes of PVC pipe to fabricate the trunks of trees. The PVC pipe was covered with a thickened epoxy and the epoxy was textured to look like bark. Fabricated branches and leaves were then attached. During my last year at Larson (1998, the same year I started Raven Studios) it occurred to me that the 8.5″ dia PVC pipe would be just the right size for a wooden dummy body. It would be very strong, lighter and much easier to make than wood, and therefor less expensive. It would be easier to transport and less expensive to ship as well. I started Raven Studios in 1998 and after experimenting with how PVC functioned as an alternative to a wooden dummy body, I sold my first PVC dummy in the year 2000. Being very rugged, dependable and economical training tools, PVC dummies are now commonly used by Wing Chun practitioners all over the world.